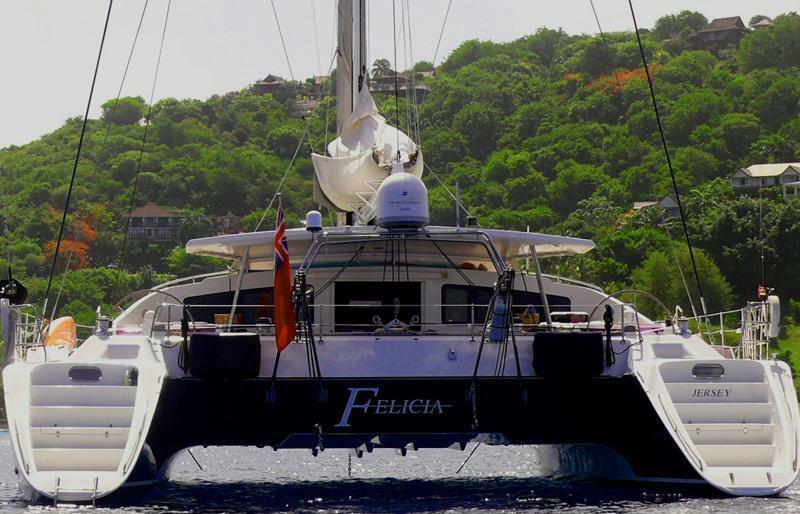 FELICIA’S elegance sets her apart from any other catamarans available for charter. 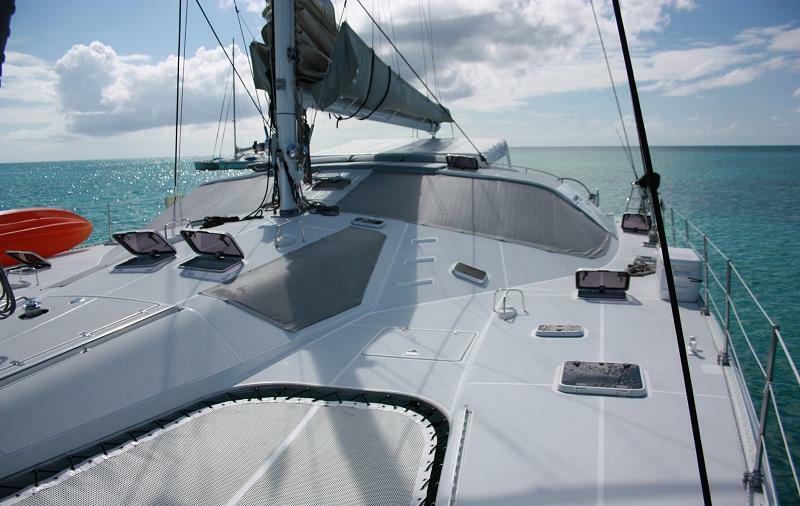 Being a 65’ long catamaran she is incredibly spacious and she has been constructed and maintained to extremely high standards. 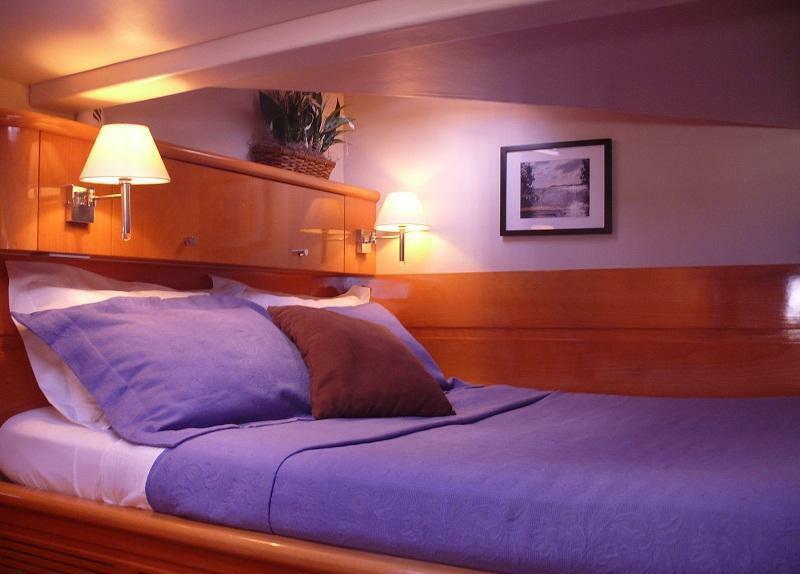 Not only does she provide an ideal environment for groups of up to 8 adults but she is equally well suited to a large family vacation or two families who wish to relax together. 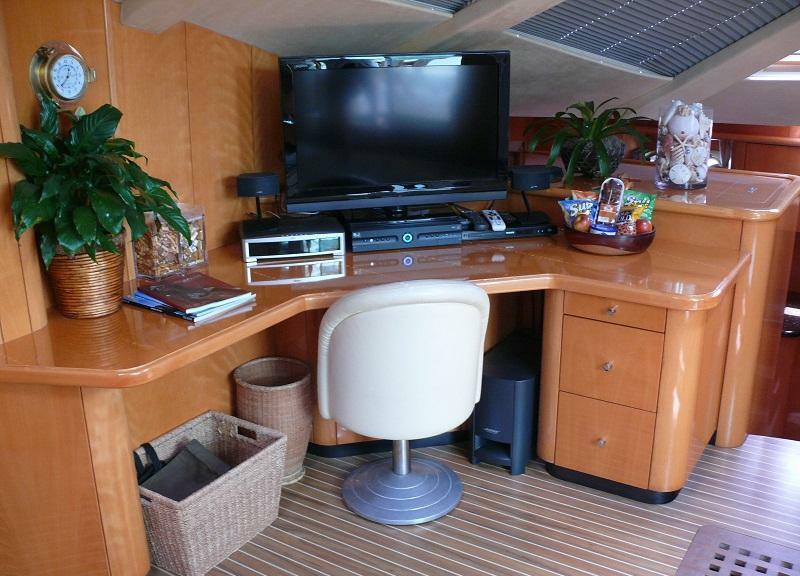 The wild beech interior is complemented by Felicia’s owner’s understated yet impeccably good taste. 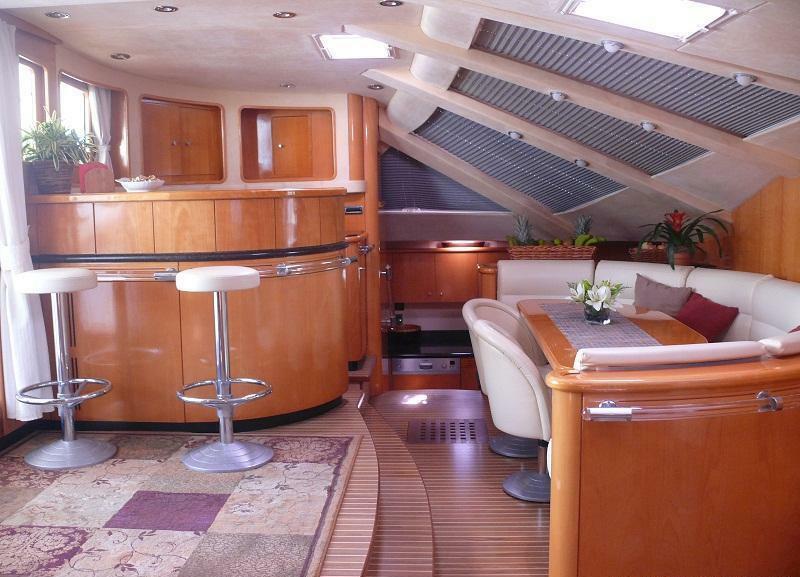 She is, in essence, a private yacht available to be shared with select guests. 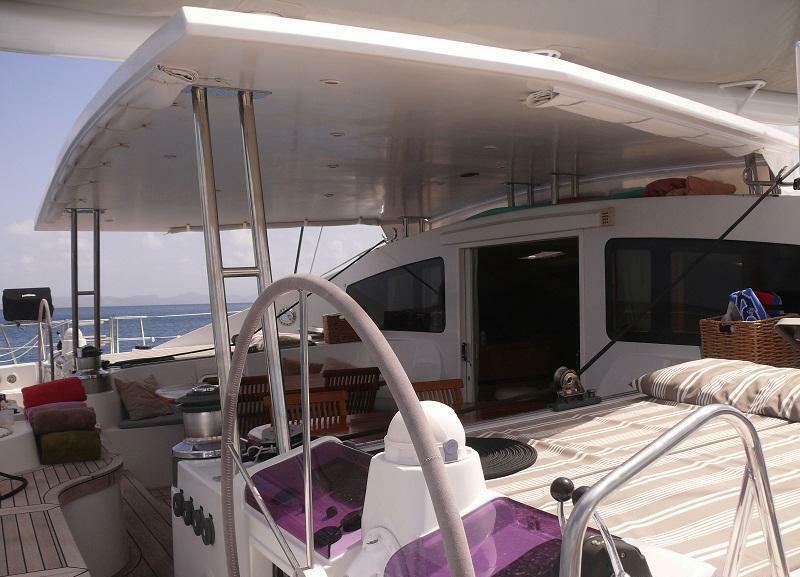 The vast deck space includes sun-bathing mattresses, trampolines and two large stepped swim platforms. 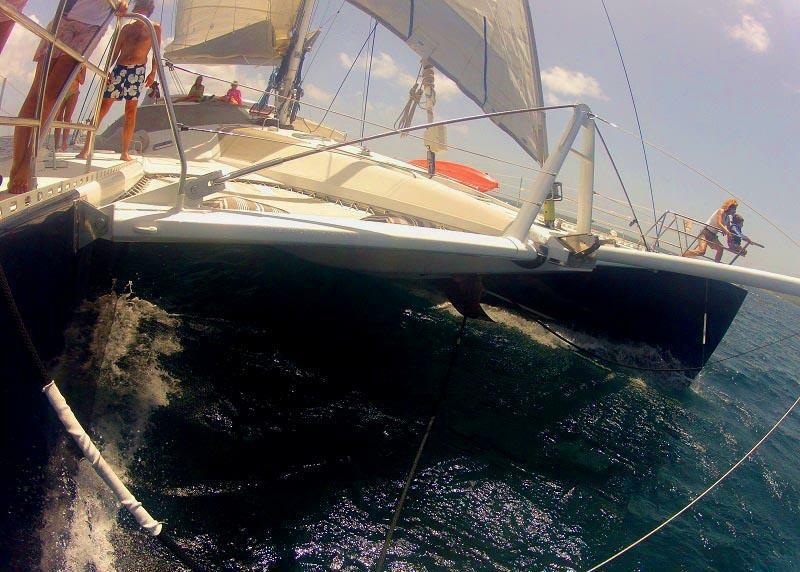 Each day your only priority will be to decide between sailing, swimming, snorkelling, waterskiing, windsurfing, wakeboarding ... 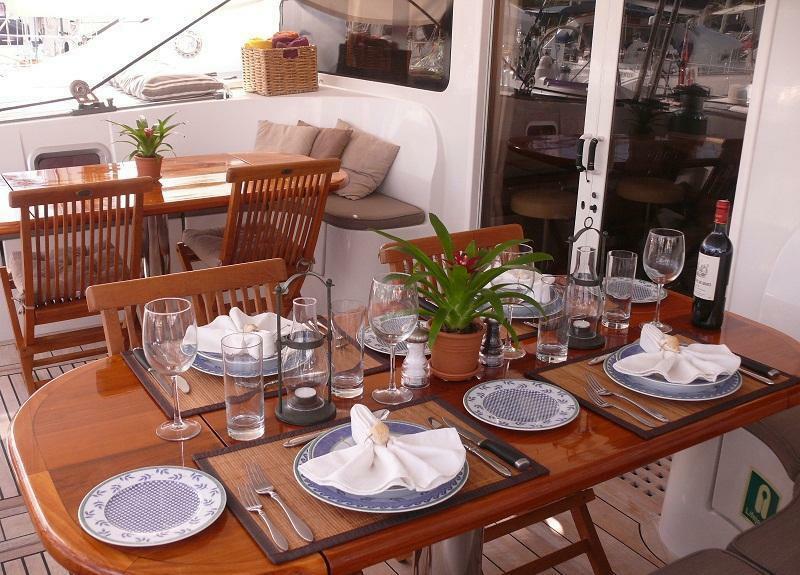 The pair of teak dining tables in the enormous cockpit provides the perfect base for al-fresco meals which are prepared and served by our professional yet charming crew. 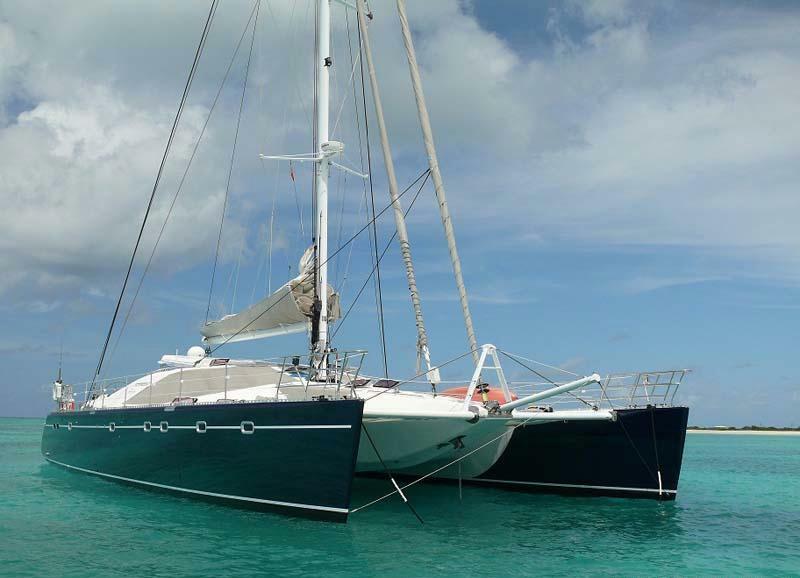 In keeping with our philosophy for Felicia our crew have been carefully selected for their professionalism delivered with true charm and integrity. 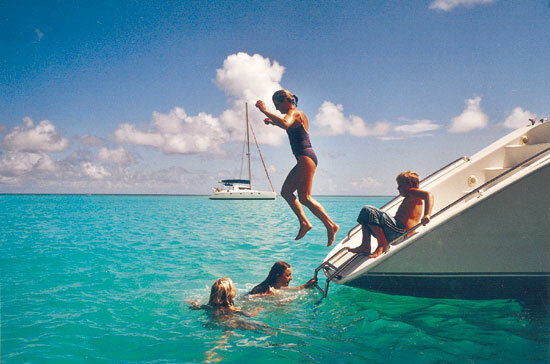 Their infectious love of our yacht and the areas we visit will add immeasurably to your stay aboard. 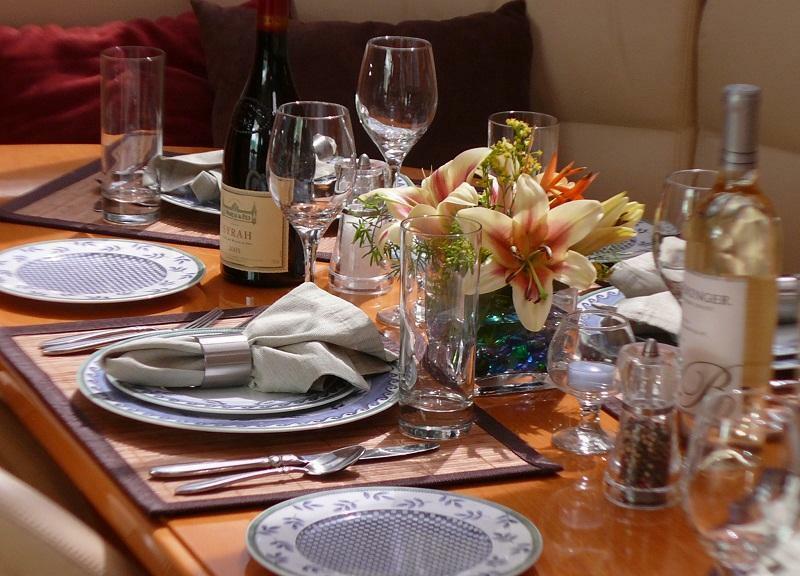 The requirements of guests will always differ. 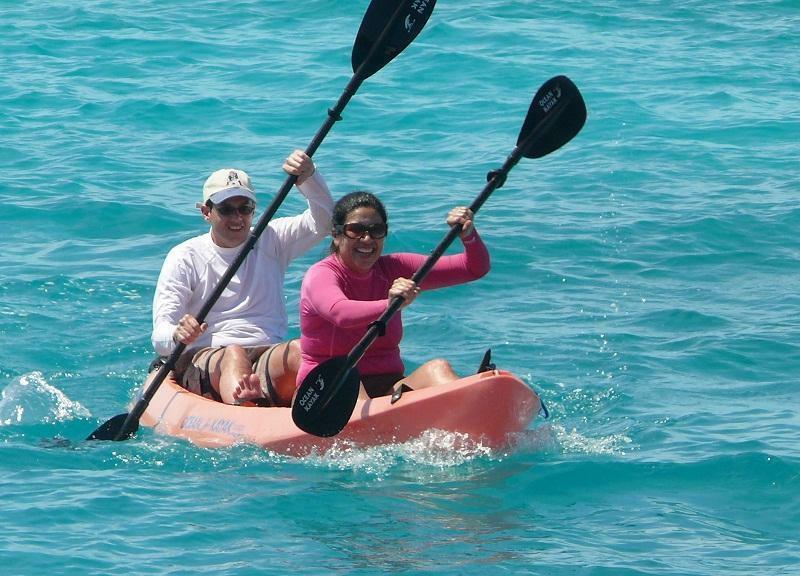 Some will prefer a greater emphasis on watersports, others on secluded beaches and yet others on excursions ashore. Our constant theme, however, is that you will enjoy the freedom that no other holiday will match. 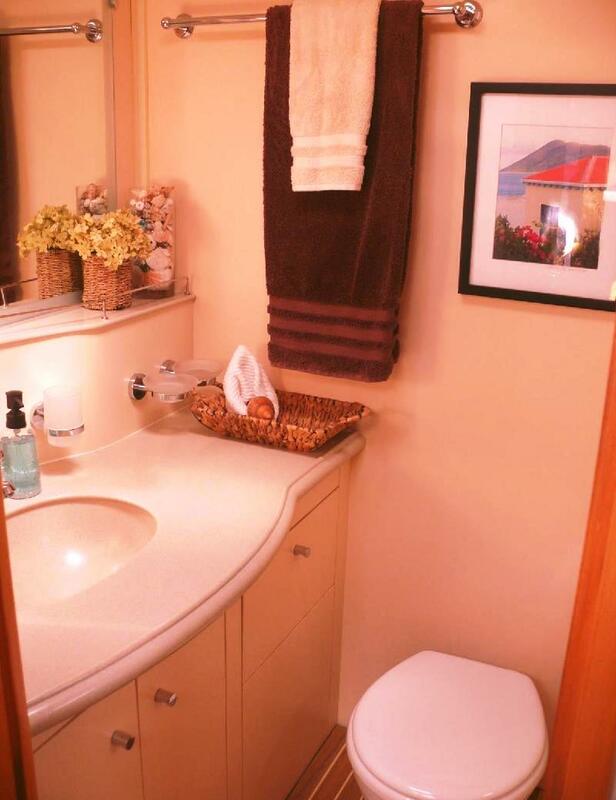 Privacy and discretion are, of course, guaranteed. 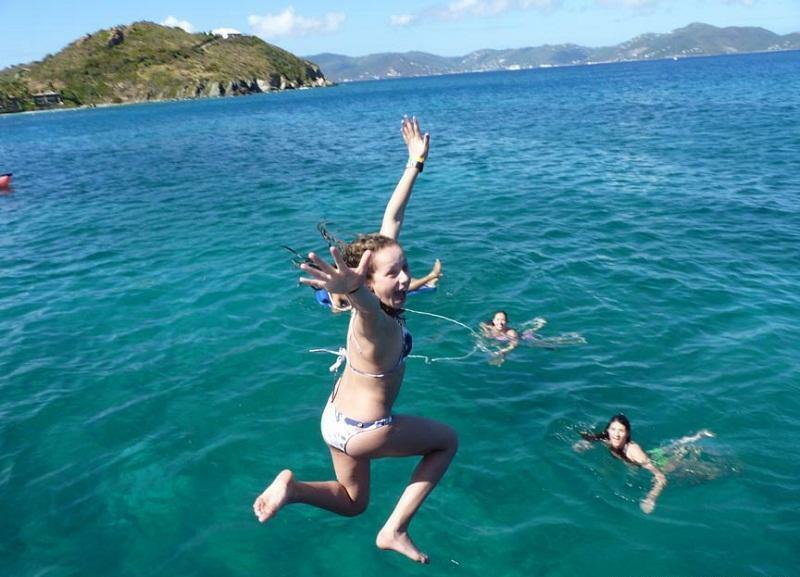 Year round we cruise the Caribbean. 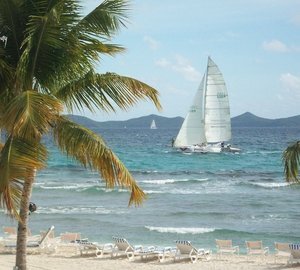 Favourite areas of the British and U.S. Virgin Islands provide short passages between islands, often under 1 hour in length. 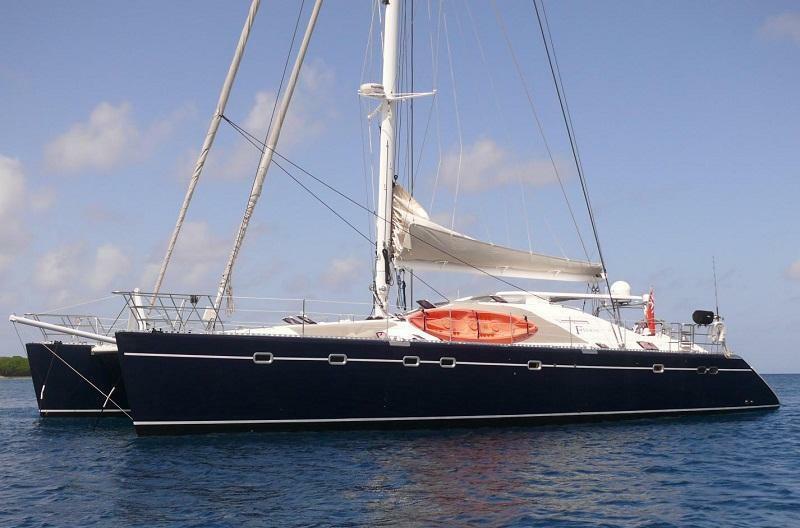 For those seeking to venture further afield the Leeward Islands from Antigua to St Martin provide fantastic variety, including the seclusion of Barbuda and Anguilla enhanced, perhaps, by a trip ashore on St Kitts or Nevis with the chance of combining a meal with a sighting of green-backed monkeys. 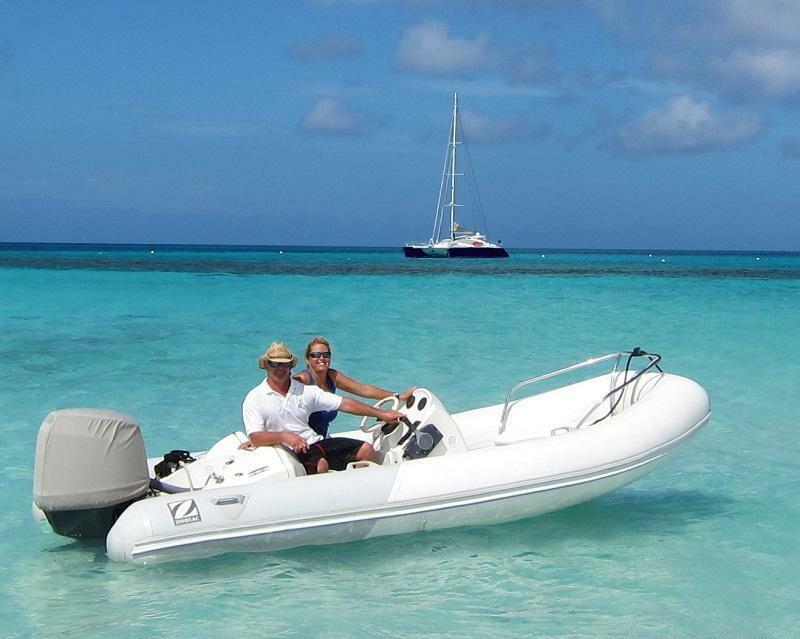 Further South the Windward Islands leading down to the Grenadines including such wonderful islands as St Lucia and Mustique and the stunningly beautiful Tobago Cays. You will lose your heart just as we have done! 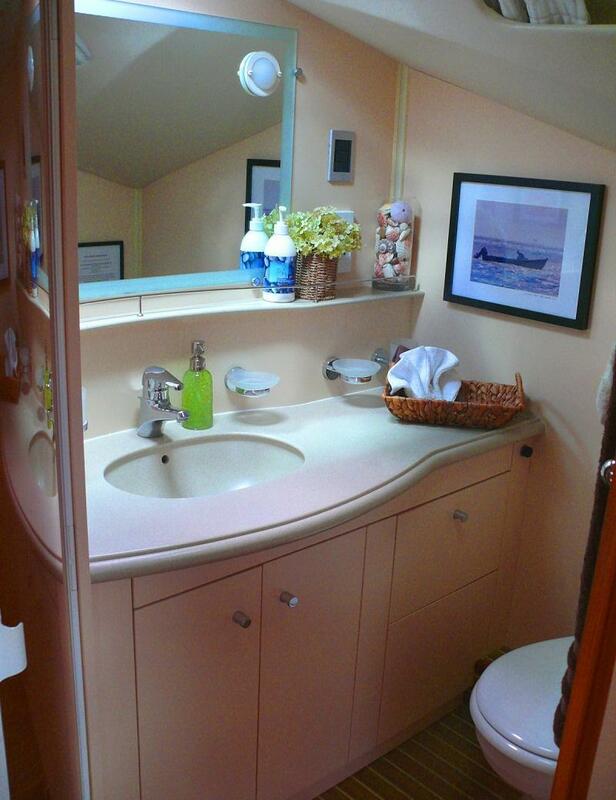 4 Luxurious double cabins, each with en suite shower room and heads. 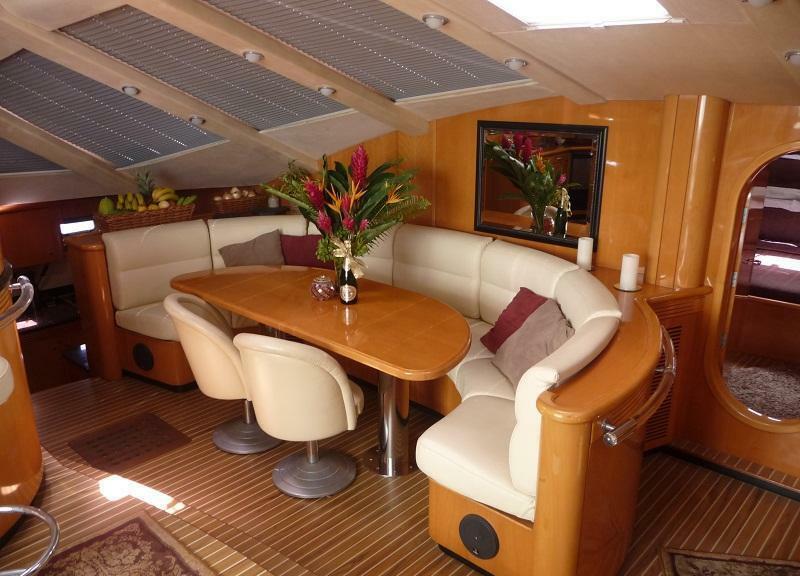 Her guest accommodation comprises 4 double cabins, each with their own en-suite facilities, a huge saloon which includes a bar, indoor dining table and a writing/games desk. 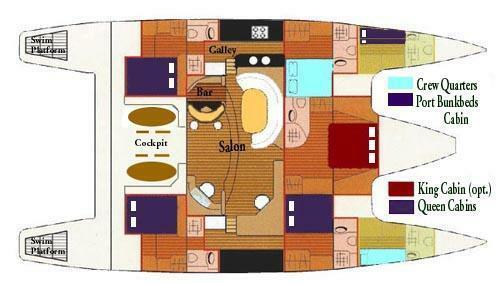 The cabins and saloon are all air-conditioned and both master cabin and saloon benefit from TVs with video and DVD players for which a substantial library of films is available on board. 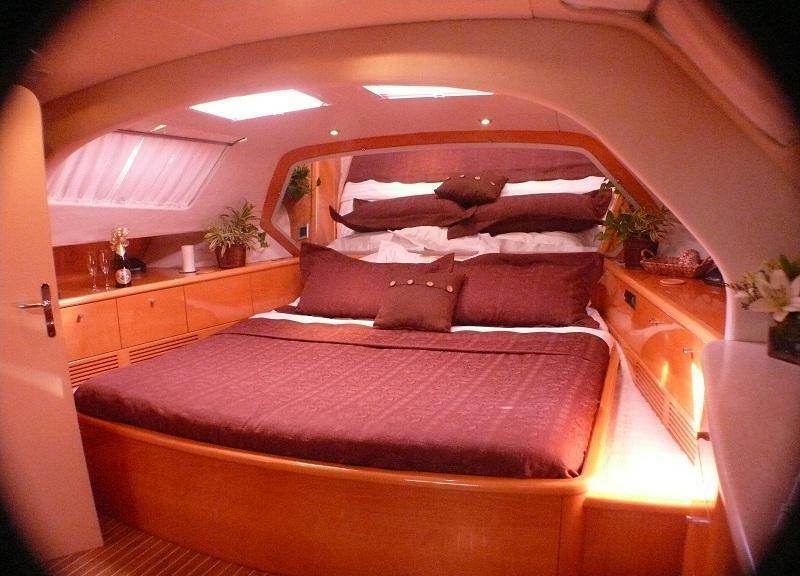 The crew’s quarters are accessed completely independently. Equipment & electronics Saloon Air conditioning Radar - VHF - GPS - Autopilot Satellite & Mobile Telephone Computer Stereo CD - Cassette - FM with indoor and outdoor speakers TV & DVD Player Cabins Air conditioning Radio/Cassette - FM and TV with VCR and DVD (Master Cabin) Outlet 220 volts (110V adaptors available) Fans Watersports/Recreational Equipment Double seat kayak Windsurfer Passenger fully reserved small 10ft/3m dinghy - 5 HP Wakeboard, kneeboard and waterskis 15ft/5m Dinghy tender - 75 HP Masks, fins and snorkels Floating mattresses Fishing equipment Small library with a variety of board games, books, CDs and DVDs Engines & Generators 2 x 88HP Entertainment Water maker 60 Gals / hour Freezer - Fridges - Ice Maker Bar / Saloon - Air Conditioning Electricity 12-24-220 V Communications VHF, GPS Samples from Jo's Menu Entrees Fresh asparagus with hollandaise. Prawn sesame toasts, vegetable rolls and marinated prawns served with a sweet chilli sauce. Caramelised figs, shallots with pancetta and parmesan wafers. Mille-feuilles of smoked salmon, prawn and horseradish with wafer potatoes and mushroom confit. Roasted onion and pepper tartlets with grilled goats cheese. Grilled prawns with aioli. Main Courses Herb crusted French trimmed lamb with herby mashed potato. Stuffed fillets of pork on a bed of tagliatelle with a white wine sauce. Pan fried fillets of dorado with a Thai rub. Jasmine rice and julienne of vegetables. Chicken breasts stuffed with roasted red peppers, prawns and mozzarella. Wild rice. Veal escalopes flambade with sweet potato mash and honey baby carrots. Duck breasts with a port and cherry sauce. Sauteed potatoes. Fillet of seabass with gateaux d’herbes and potatoes boulangere. Desserts Rosemary shortbread with mango and lime parfait. Meringue nests with fruits of the forest. Coconut bananas with caramel. Caramelised oranges and grapefruit with quenelles of cream. Spiced apricot and honey mousse. Creme brulee with exotic fruit dice.